Mark Gillard trains with his wife Pippa and their four children - Theo, Alana, Fergus and Arthur, all of whom have ridden out the horses. Pippa, a former champion polo player, was a world champion and played for England on 40 separate occasions all over the world and continues to be involved with Ladies polo at the highest levels through her Chairmanship of the International Women''s Polo Association, which she founded in 1997. Mark has had a lifetime working with racehorses first through training Point-to-Point horses followed by three years as Assistant Trainer to Derby and King George winning trainer Peter Walwyn in Lambourn, Berkshire. 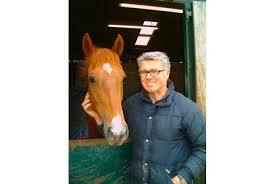 Mark then set up Elm Tree Stud buying foals for both jumping and flat racing and either racing or selling them on. In 2007 Mark set up as a public trainer from his home in Holwell Dorset. In June of that year, Mark and Pippa bought Hawkes Field Farm, located at the highest point in rural Dorset near Bulbarrow Hill. Hawkes Field Farm is a 30 acre farm which they have transformed into a specialised training facility with its own 4 furlong all-weather gallop, schooling grounds and multiple turn out paddocks. Mark and Pippa enjoy welcoming Owners into their purpose built Office/Owners Lounge to review races and discuss their horses. Each horse is given individual care and attention by Mark and his team with the training regime tailored to optimise their performance whatever the level of ability. With a relatively small number of horses in his care at any one time, every horse benefits from Mark''s hands-on approach to ensure that no stone is left unturned in the never-ending search for winners.